Hamburg, N.Y., police chief Gregory Wickett confirms his department has launched an investigation into Chicago Blackhawks star forward Patrick Kane over an alleged incident at the player's home last weekend. 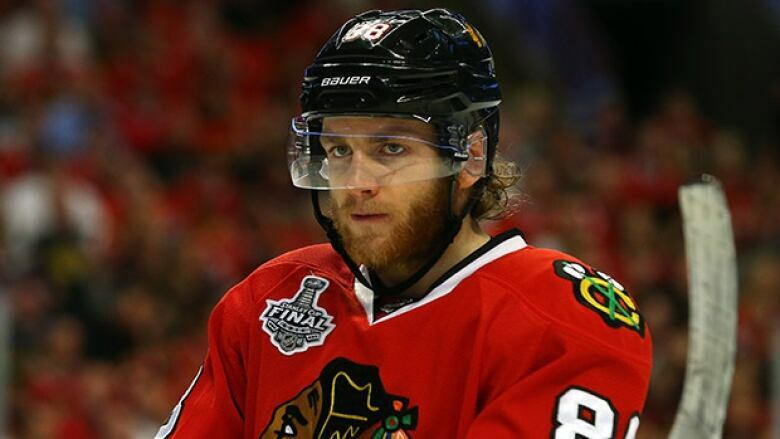 NHL star reportedly accused of sexual assault in Hamburg, N.Y.
Chicago Blackhawks star Patrick Kane is under police investigation over something that may have happened at his home last weekend. Hamburg, N.Y., police chief Gregory Wickett on Friday did not elaborate on the investigation, alluding to an "incident that allegedly occurred" at the player's off-season home in suburban Buffalo. Police are still gathering information and awaiting forensic tests, he said. Wickett made a brief statement outside police headquarters and declined to take questions. He would not say if police have spoken with Kane or if the player is co-operating. He said there will be no further comment. Word of the investigation surfaced Thursday, prompting responses from the NHL, Blackhawks and Kane's agent, Pat Brisson. The investigation began Sunday night, when several plainclothes officers searched the grounds around and inside Kane's off-season Hamburg home, which overlooks Lake Erie. The 26-year-old Kane is from Buffalo and his family still lives in town. The Blackhawks said in a statement Thursday: "We are aware of the matter and are in the process of gathering information. It would be inappropriate to comment further at this time." The NHL added it is "aware of a police investigation" and "following developments." A four-time all-star, Kane is scheduled to make $13.8 million US in the 2015-16 season — the first in an eight-year, $84-million US extension he signed last summer. This is not the first time the 2013 Conn Smthye Trophy winner has been involved in an off-season incident. Kane pleaded guilty to a noncriminal charge of disorderly conduct after he and a cousin were accused of assaulting a Buffalo cab driver in 2009.